Imagine your roadmap and sprints being as engaging as a hit movie – just think how much easier they’d be to “sell” to your stakeholders and customers! Let’s see how you can do this. 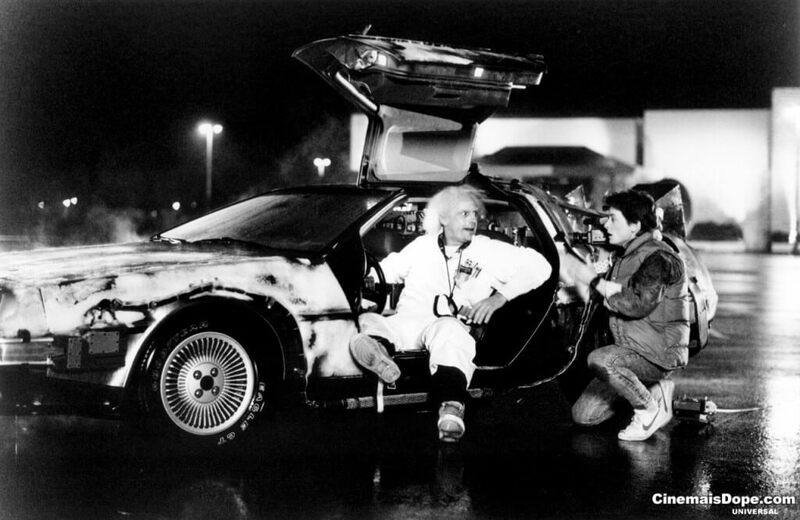 At the beginning of the film, we’re introduced to the main characters and the DeLorean time machine. The arrival of the irate terrorists, who gun down Doc Brown and cause Marty to travel back to 1955 accidentally as he tries to escape, sets in motion the main events of the film. 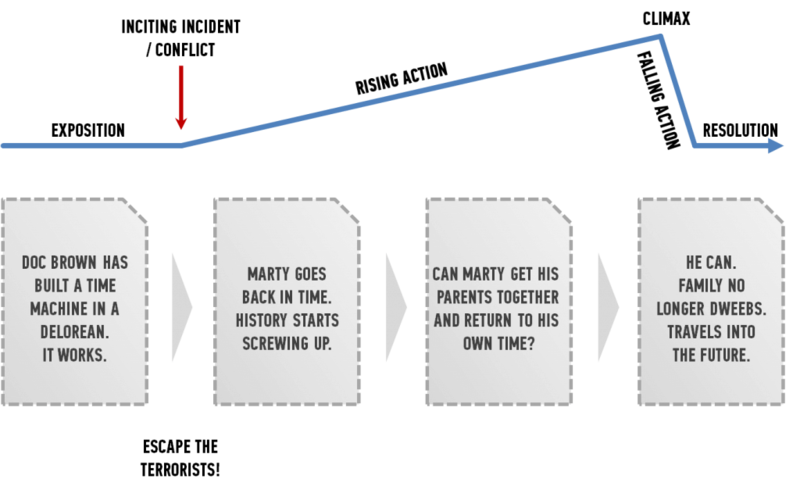 The middle act of the film builds the action as the 1955 Doc Brown realises that Marty has inadvertently changed his history by possibly preventing his parents ever getting together. 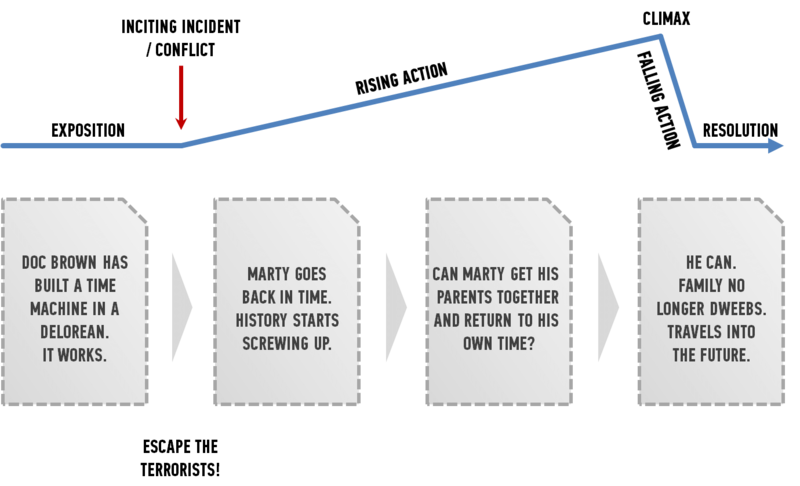 Marty attempts to rectify the situation before he misses the climactic lightning strike that will power the DeLorean’s flux capacitor and send him back to the future. The story concludes with Marty successfully back in 1985, reunited with his girlfriend and discovering that his family is no longer a bunch of losers. Then the Doc shows up again in the DeLorean and whisks Marty and Jennifer into the future – ready for the sequel. Your product’s going somewhere, isn’t it? That’s why you’ve created a roadmap. So think of it as having the same structure as a story arc. You start off by doing your market research, speaking to potential users of your product, and building up a picture of what your product needs to be to solve their problem elegantly and profitably. At the end of those conversations, you should have a good idea of what that first release is going to be, who it will be for, and what it needs to include. 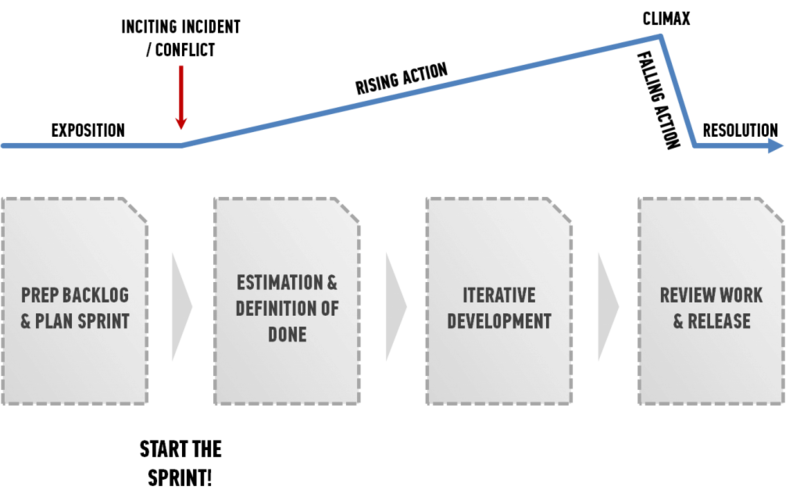 Then you’re ready to start the iterative development process. 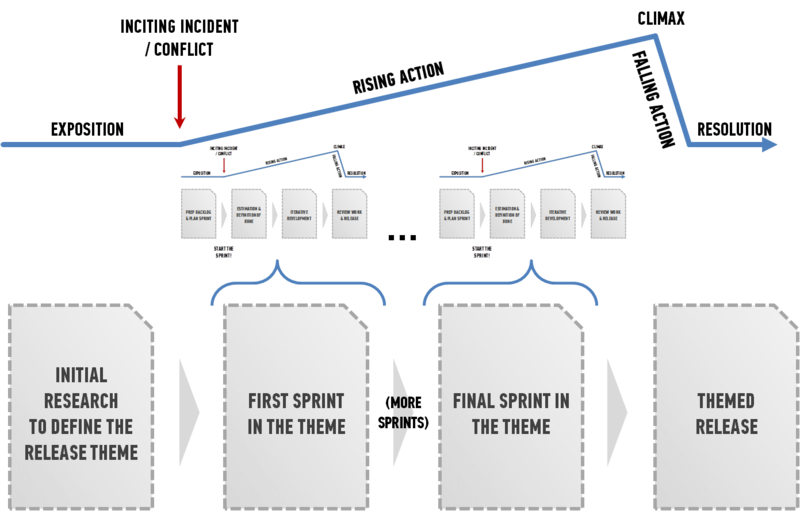 Like the opening scenes in Back to the Future, the build-up to the start of the first sprint will be exciting, but it will take a little while for things to get moving – like when Marty’s just arrived in 1955 – while the development team sets the scene, establishes the build environment and gets the fundamentals in place. Momentum will build, though. 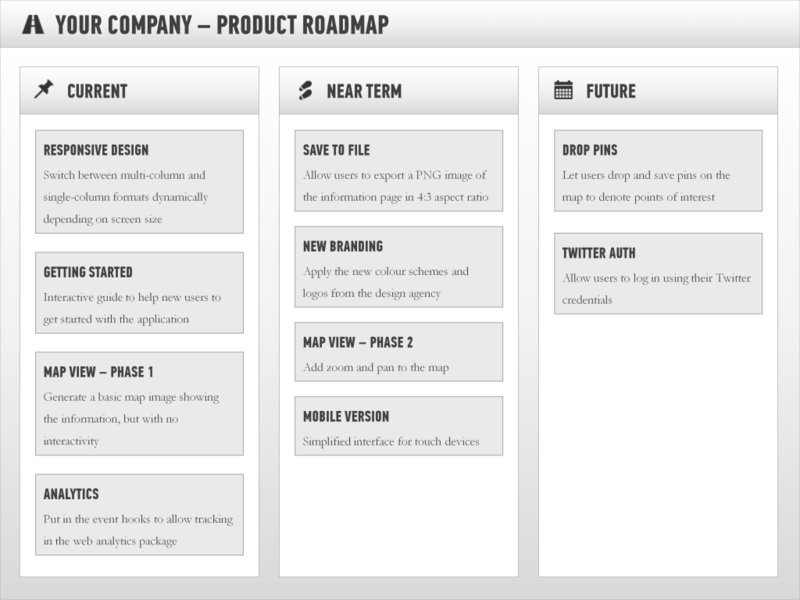 Sprints will come and go, as the product takes shape. 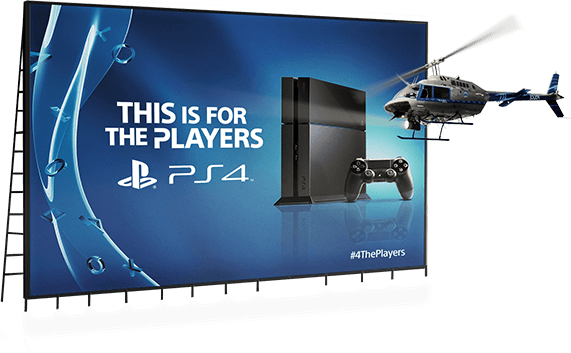 Alongside the development, there are separate, parallel streams of launch preparation such as marketing and logistics that are all building towards the big release. As you get closer, you’ll draw together all these different plot threads so that the climactic conclusion ties them all together neatly. You don’t have to stop there. Why not bring a bit of narrative structure to individual sprints as well? You’ll set the scene by grooming the product backlog and deciding which items should be tackled together in a sprint, then by breaking down the epics into user stories. 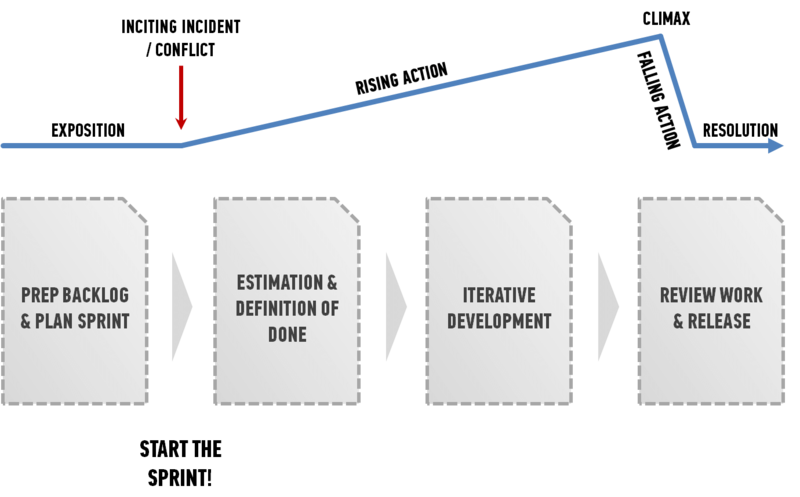 When you start the sprint, again things start slowly with the sprint planning session to lay the foundations for the rest of the sprint, such as story point estimation and definition of what “done” looks like. The development continues through the sprint, building up to the final day of the sprint, where the work is reviewed and sent live if needed. Then the sprint concludes with a retrospective that looks over the action of the sprint and sets up the changes that will be made in the sequel. Each themed release might need a few sprints or more to deliver the required functionality, and you may have the luxury of multiple teams to tackle themes in parallel, but every team and sprint is working towards the conclusion that you’ve defined clearly. So Kasey – I hope that answers your question! I’d love to know what you think about this approach. Post a comment below. This entry was posted in Agile, Development, General, Roadmaps and tagged agile, backlog, communication, films, Launch, Requirements, roadmaps, sprint, story, theme by Jock Busuttil. Bookmark the permalink.